Census Bug Tracking and Defect Tracking 6.0 free download. Role-based Workflow - Census provides powerful workflow technology that can be customized to your specific business requirements. Automate the tracking and management of bugs through the stages of your process. Define the different states (such as New, Assigned, Fixed). Create rules for transitions between states. Define dependent fields to simplify data entry and automate process rules. Ensure that changes in bug status and ownership follow your business processes. E-mail notifications - keep team members, users and management in the loop with automatic e-mail notifications. Define custom "when rules" to trigger e-mail notifications when an issue is logged or updated, when a field changes, or when a field is set to a specific value. Reports and Metrics - pre-defined and ad-hoc reports let you measure project status, progress, and goals. Census includes more than 45 pre-built reports that provide summary, detailed, and trend information. Point-and-click report editors make report building fast and easy. Build custom reports and charts and publish them on the Web using today's leading report writer, Crystal Reports. 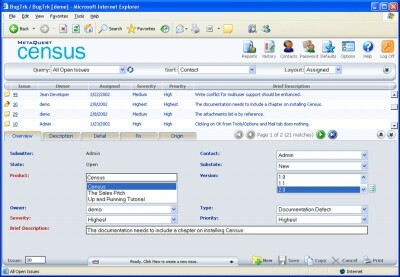 Customization - easily adapt Census to your organization's process and terminology. Use point-and-click editors to customize fields. Brand Census with your company logo and colors. Generate custom Web views for different users. For example, different Web views for customers, developers, and QA. Version Control Integration - enjoy the advantages of team coordination and version tracking directly from your bug tracking tool. Access centralized Visual SourceSafe databases through a Web browser. Check source files in and out, get the latest/previous versions, undo changes, and view change histories, all through a Web browser. WBS Issue Tracking is a web-based system designed for tracking work orders, tasks, defects, bugs and other various nature issues. Advanced Defect Tracking is desktop defect tracking solution designed for small, medium and large software companies to simplify their bug, defect, suggestion and feature request tracking. yKAP Bug Tracking / Issue Management Software is a powerful, customizable, cost effective, web based (XML) bug / defect tracking, messaging, issue management product. Bugzero gives you a cost-effective answer to increase team work efficiency. Bug Tracker is a tracking application which will allow you to track, manage and assign all of your bugs and features to organize your bug(s), defect(s) or issue(s) during software development. Dev Hound is a useful web based project management system designed for bug tracking, development teams, tracking projects, clients, software releases, knowledge bases and support calls. Escalation Tracking web database is an easy to use, easy to setup program designed to work with your existing IT framework to help provide visibility to field problems to the factory level.